Orion Premiership leaders Lovat lost their 100% record for the season when they went down 2-1 away to Glenurquhart on Premiership derby day. This allowed Newtonmore to narrow the gap to two points with a game in hand after their 5-2 victory over Badenoch rivals Kingussie. Inveraray ensured there was no repeat of the previous Saturday's 5-1 MacAulay Cup defeat by Argyllshire opponents Kyles when they pulled off a 4-1 victory at the Winterton. And in the only top tier game which didn't involve local rivals, Kinlochshiel had a 3-2 success against Lochaber, who are now two points adrift at the bottom. David Smart scored early in the first half and James MacPherson early in the second for Glenurquhart and although Owen Ferguson got one back for Lovat on the hour, Glen held on. 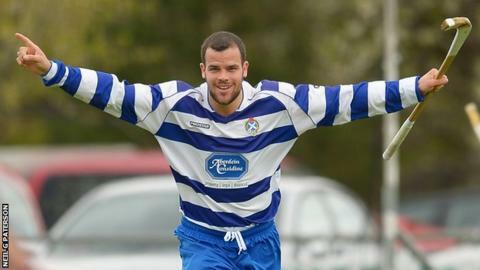 At The Eilan, Danny MacRae, Evan Menzies and Glen MacIntosh all scored within four minutes just before half time before Glen MacIntosh again, and Fraser MacIntosh made it 5-0 Newtonmore. Thomas Borthwick and Fraser Munro responded for Kingussie. When Roberto Zavaroni found the net in the first minute for Kyles, Inveraray must have been concerned about another eclipse. But Euan McMurdo, Peter MacIntyre and Grant Griffin had them 3-1 up before the half hour and Neil Campbell clinched it in the second half. Three different MacRaes - Keith, Aistair and Duncan Ach - were on target for Kinlochshiel while Stuart Callison and Shaun Nicholson created a nervous conclusion to the game as Lochaber fought back. There were also eight ties in the first round of the Scottish Hydro Camanachd Cup before the entry of the Premiership teams. Beauly got off to a flying start in their 5-1 success at home to Oban Camanachd when Marc MacLachlan laid the foundations of his hat trick with two in the first eight minutes. Bute haven't had their troubles to seek this season but comfortably disposed of Taynuilt 4-0 in Rothesay. Ballachulish beat visitors Oban Celtic 5-0 in their South derby. The highest scoreline was at Strachur when away side Kilmallie won 7-4, including for from Craig MacIsaac. Caberfeidh beat Kilmory 3-1 in Strathpeffer and Inverness came from 2-0 down to edge Strathglass 3-2 in Cannich. That was also the score for Fort William away to Glasgow Mid Argyll while the remaining place in the second round draw on Tuesday 6 May went to Skye, who were 6-2 winner over Glenorchy in Dalmally.